Avianca Brazil is accelerating expansion as the carrier aims to regain market share in Brazil’s fast-growing domestic sector. Avianca Brazil, previously known as OceanAir, now plans to end 2011 with 26 aircraft, up from only 17 aircraft at the start of the year. At least another five aircraft will be added next year as Avianca Brazil has emerged as the unlikely new home for the 15 A318s exiting the fleet of rival Latin American airline group LAN. Avianca Brazil president Jose Efromovich told CAPA at the sidelines of the ALTA Airline Leaders Forum earlier this month that the carrier has agreed to acquire all 15 of the A318s exiting LAN’s fleet. Mr Efromovich says five of the A318s have already been delivered to Avianca Brazil while five more will be delivered in 2012 and the final five aircraft will be come in 2013. The 15 A318s are being remarketed by Airbus as LAN returns the aircraft in exchange for larger A320 family aircraft. Airbus was expected to have a very hard time finding new homes for the aircraft given the unpopularity of the A318 and the fact the LAN examples are powered by PW6000 engines – an engine type engine unique to LAN’s A318s. All the other A320 family aircraft in the fleet of Avianca Brazil and sister Colombian carrier Avianca are powered by CFM56s, including the 10 ex-Mexicana A318s which Avianca took from GECAS earlier this year. While Avianca and Avianca Brazil have some common ownership and a co-branding arrangement, only Avianca is currently part of Avianca-TACA Holding (TACA also operates A320s but with IAE V2500 engines). Avianca Brazil already operates three A319s, all of which were delivered last year. Mr Efromovich says in addition to the A318s the carrier is now in the process of adding its first batch of A320s. He says Avianca Brazil took delivery of its first A320 in mid-November and three more of the type will be delivered by year-end. Mr Efromovich says the additional aircraft will drive a capacity increase of 71% in Jan-2012, compared to Jan-2011. Most of the additional capacity is being directed to existing routes. The A320s will primarily be used to increase capacity at slot-controlled airports as Avianca Brazil’s most popular flights are up-gauged to A320s. The Efromovich family investment firm, Synergy, owns 100% of OceanAir. Synergy also acquired Avianca in 2004 and is now the largest single shareholder in Avianca-TACA Holding, which was formally established early last year following Avianca’s merger with Grupo TACA. OceanAir was originally an air taxi company which expanded into the scheduled passenger airline market early last decade. The Efromovich family decided to pursue rapid expansion at OceanAir following the collapse of Brazilian flag carrier Varig. As a result, OceanAir significantly expanded its domestic operation in late 2007 and early 2008. It also began international flights in 2007 with newly acquired B767s. But in 2Q2008, Synergy initiated a major restructuring at OceanAir which led to a significant reduction in the size of its fleet and network. International flights ended and domestic capacity was cut as several aircraft types including B737s, B757s and B767s were phased out, leaving only one aircraft type in the fleet – Fokker 100s. OceanAir’s share of Brazil’s domestic market slipped significantly after reaching a high of 4.2% in 1Q2008. Synergy decided against adding capacity in 2H2008 and again in 2009, keeping the fleet at 14 Fokker 100s. As a result, the carrier’s market share slipped further as the overall Brazilian market expanded rapidly. In 2009 OceanAir captured only 2.5% of Brazil’s domestic market, based on RPK data from Brazilian civil aviation authority ANAC. “For two years we were just doing our homework. We were improving our process and improving the systems,” Mr Efromovich explains. Avianca Brazil resumed expansion early last year, just as it was rebranded from OceanAir. The Mar-2010 rebranding coincided with the delivery of the first A319. The three A319s generated a 22% increase in ASKs and helped, along with higher load factor, push RPKs in 2010 up by 27%. Avianca Brazil’s market share increased slightly to 2.6% for the full year as it was able outpace the 23% increase in RPKs recorded by the entire Brazilian industry. Avianca Brazil has been able to make even larger market share gains this year as the first batch of five A318s were added. 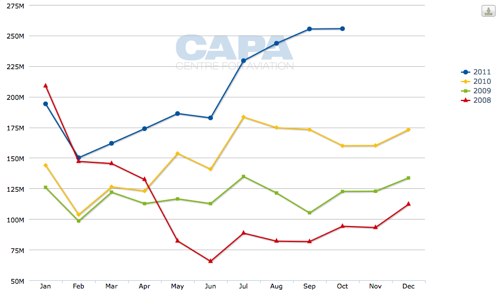 Through the first 10 months of 2011, the carrier’s capacity (ASKs) was up 28% and traffic (RPKs) was up 37%. The overall Brazilian market was up 14% in terms of ASKs and 17% in terms of RPKs through the first 10 months of this year. 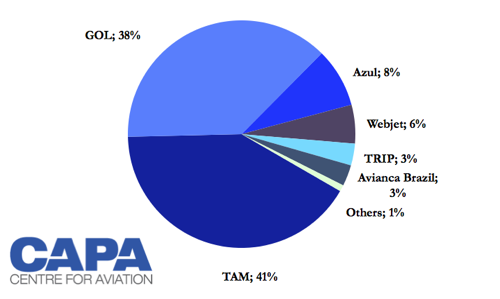 As a result, Avianca’s Brazil share of the total Brazilian domestic market RPKs grew from 2.6% in the first 10 months of 2010 to 3.0% in the first 10 months of 2011, according to ANAC data. In recent months, the growth at Avianca Brazil has been particularly impressive. 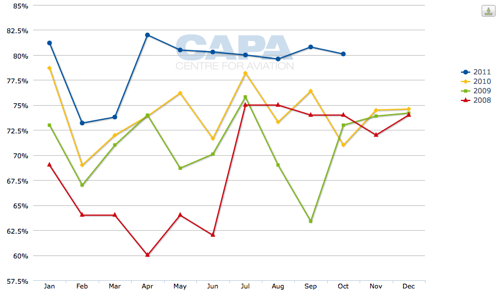 For example, in September Avianca Brazil’s RPKs were up 47%, giving the carrier a 3.8% share of the market. In October, Avianca Brazil RPKs were up 60% as it captured 3.7% of the market. Avianca Brazil will likely see its market share exceed 4% next year and potentially approach 5% as the carrier continues to grow much faster than the overall Brazilian market, which is expected to only post high single-digit growth for 2012. The carrier’s previous record-high market share of 4.6%, set in Jan-2008, could be broken, indicating a full claw back of market share since the 2008 restructuring. In terms of monthly domestic traffic, Avianca Brazil is now bigger than it was prior to the 2008 restructuring. In Sep-2011 Avianca Brazil flew more than 250 million flew domestic RPKs for the first time in its history. Avianca Brazil and regional carrier TRIP, which also been growing at a rapid clip, are now roughly tied for fifth place in the Brazilian market, behind TAM, Gol, Azul and Webjet. Avianca Brazil could become Brazil’s fourth largest carrier next year as a result of Gol’s pending acquisition of Webjet, which is expected to be completed in mid-2012. While Avianca Brazil is not about to approach the size of TAM, Gol or Azul, the carrier is targeting a different and smaller sector of the market. Mr Efromovich says Avianca Brazil continues to offer a full service even on its shortest flights. While Avianca Brazil’s entire fleet is in single-class configuration, he says Avianca Brazil has the most generous domestic economy class seat pitch among Brazilian carriers. Avianca Brazil configures its A319s with 132 seats and its newly delivered A320s with 164 seats. Its A318s have 120 seats while its Fokker 100s have the standard 100 seats. While Gol and TAM recorded significant drops in domestic yields in 2Q2011 and 3Q2011, Mr Efromovich says Avianca Brazil’s unique product has allowed the carrier to maintain its fares. “We don’t participate in those price fights,” he says. Avianca Brazil also has been able to keep its aircraft full. The carrier’s 79.3% load factor through the first 10 month of 2011 was significantly better than the industry average load factor of 70.5%. 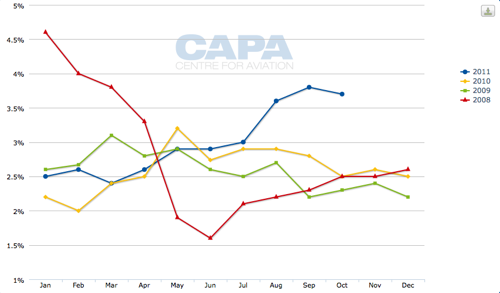 Avianca Brazil recorded an 80.1% load factor in Oct-2011. Avianca Brazil has consistently recorded higher than average load factors since the 2008 restructuring. It ended 2010 with a 74.3% load factor compared to a 68.8% average for the industry while it reported a 71.2% load factor for 2009 compared to an industry average of 66.8%. Avianca Brazil currently only operates domestically with the exception of one international route, Sao Paulo-Bogota, which it launched in Nov-2010 using its all-economy A319s. More international routes are being considered including regional destinations such as Santiago. The resumption of long-haul routes, which could be launched in the medium- to long-term with A350s, is also a possibility. Synergy placed orders in 2008 for 10 A350s. Mr Efromovich says Synergy will decide later whether the A350s will be used to launch long-haul routes from Brazil or Avianca-TACA hubs. Currently Avianca-TACA only operates widebody aircraft from its Bogota hub, although it is considering adding widebody operations in Peru and Central America. Avianca-TACA also has 10 B787s on order, although these aircraft are already earmarked to replace Bogota-based A330s while the base for the A350s remains uncertain. Mr Efromovich says he “is not worried” about having to find homes for Synergy’s A350s given it has several options. It also has plenty of time as Mr Efromovich states Airbus has not yet provided revised delivery dates for Synergy’s A350s, which were previously slated for 2015. Mr Efromovich points to the flexibility Synergy has had in placing the A320s it ordered. Aircraft from this order have so far ended up at carriers in Brazil, Colombia, Ecuador and Central America. “This is an advantage we have,” says Mr Efromovich. Synergy’s large A320 family order book, which includes 33 A320neos which were ordered earlier this year, gives Avianca Brazil the flexibility to again rapidly expand if Synergy believes there is an opportunity in the Brazilian market. For now the carrier is only committed to adding five A318s next year but Mr Efromovich says it will look at taking some of the A319s or A320s from Synergy’s order. “We’ll see what happens in the first quarter,” he says. Avianca Brazil will also need to tap into Synergy’s A320 orders when it is time to replace its 14 Fokker 100s. Mr Efromovich says Avianca Brazil plans to continue operating its Fokker 100s until their next heavy maintenance check, which he says will come up in two to three years. Synergy acquired 29 Fokker 100s from American Airlines in 2005, with the other 15 Fokker 100s allocated to Avianca. All 15 of Avianca’s Fokker 100s have now been replaced with the ex-Mexicana A318s. Synergy has always been an opportunistic acquirer of used aircraft. With the ex-LAN aircraft Synergy was offered a lease deal which was evidently too good to pass up. The A318s are not seen by Avianca Brazil as a long-term solution and are expected to eventually be replaced with larger A320 family aircraft, also from Synergy’s large order book. E190 or CSeries family aircraft could also be a potential medium to long-term solution for Avianca Brazil's thinner routes. The Efromovich family has previously said ownership of Avianca Brazil will eventually transfer from Synergy to Avianca-TACA. Jose Efromovich is also a board member of Avianca-TACA Holding while his brother, German Efromovich, is Avianca-TACA’s chairman. But Avianca-TACA CEO Fabio Villegas told CAPA at the ALTA Forum that it is not yet decided when or if Avianca Brazil will become part of Avianca-TACA. Mr Villegas says for now the two companies are happy with their co-branding agreement, which has so far proven to be successful. Having the Avianca brand in the domestic Brazilian market has increased Avianca-TACA’s exposure in Brazil, allowing for the group to pursue expansion of its Brazilian operation. Avianca earlier this month launched flights from its Bogota hub to Rio de Janeiro. Mr Villegas says Avianca also plans to add in early 2012 a second daily flight from Bogota to Sao Paulo to meet increasing demand between the two countries. Avianca Brazil will maintain its single flight on this route, giving the two carriers a combined three daily flights between Bogota and Sao Paulo. Avianca Brazil also has a close relationship with Lima-based TACA Peru, which serves four destinations in Brazil: Brasilia, Porto Alegre, Rio de Janeiro and Sao Paulo. Avianca Brazil may also potentially join its sister carriers in Star Alliance. When Star accepted Avianca-TACA into the alliance last year, new Avianca-TACA Ecuadorean subsidairy AeroGal and Avianca Brazil were excluded. Star, however, will likely push for Avianca Brazil to join the alliance in the event that TAM, which is in the process of merging with oneworld’s LAN, leaves Star for oneworld. Avianca Brazil’s expansion clearly makes the carrier more attractive to Star as it will be able to provide the domestic connections Star carriers would look to maintain in the likely event of TAM leaving Star. Avianca Brazil already has a large operation at Sao Paulo Guarulhos, the Brazilian gateway for most Star members. Avianca Brazil has gone through a drastic transformation over the last four years. Profitability, which the carrier expects will be achieved from next year, and membership in Star would cap the turnaround. Avianca Brazil is often forgotten about as it is so much smaller and does not have the international profiles of Azul, Gol or TAM. But it is just as well positioned to take advantage of the expected growth in the booming Brazilian market.